A Southern Story highlights the sounds, history and cuisine of the deep south. We travel from New Orleans to Birmingham, Alabama and get a behind-the-scenes look into what makes this region culturally and historically rich. Explore New Orleans cuisine and idiosyncrasies, the origin of American music in Memphis, Nashville and Muscle Shoals, and the importance of the Civil Rights Movement in Birmingham. Day 1: This evening, mingle with other group members at a meet and greet reception hosted by our Tour Manager, for an over-view of our 8-day exploration of Southern culture, music, and food. Day 2: This morning visit some of New Orleans varied neighborhoods. The Garden District homes are still known by the names of the families that built them over a century ago, and the Tremé is a vital American landmark for African-American and Creole culture. This afternoon experience New Orleans through its cuisine. The walking and tasting tour of the French Quarter, will highlight the varied ethnic influences that contribute to New Orleans cuisine. Day 3: Depart for Memphis this morning, home of American blues music, legendary musicians, famous barbecue and historic landmarks. Visit Sun Studio, birthplace of Rock ‘n Roll, followed by a visit to the Rock ‘n Soul Museum. Day 4: No trip to Memphis would be complete without a tour of Graceland. 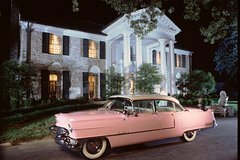 Purchased in 1957, Graceland was home to the King of Rock ‘n Roll until his death in 1977. This afternoon chose a walking tour of Memphis that includes authentic, mouth-watering BBQ with a sprinkling of history and culture or a visit to the Gibson Guitar Factory for an intimate viewing of Gibson's skilled Luthiers crafting some of the finest guitars in the world. Day 5: Upon arrival in Nashville, visit the Ryman Auditorium home of the Grand Ole Opry from 1943 — 1974. This evening enjoy the area between Broad-way and 2nd Avenue, filled with entertainment venues and night clubs, known locally as “honky tonks”. Day 6: Enjoy a driving tour through the neighborhoods of country music greats and famous Nashvillians who call Music City USA their home. Or visit Belle Meade Plantation, once known as the “Queen of Southern Plantations”. In the afternoon, visit the Country Music Hall of Fame and Museum and tour Historic RCA Studio B – where Elvis and others recorded over 35,000 songs. Day 7: "Brown Sugar," "When a Man Loves a Woman," "Mustang Sally," "Kodachrome," and "Freebird" are just a few of the tens of thousands of tracks created in Muscle Shoals. See FAME Studios, home of the Muscle Shoals Sound, and visit the Alabama Music Hall of Fame. Day 8: Tour the heart of Birmingham’s Civil Rights District this morning to see important sites in the city’s fight for Civil Rights and visit the Birmingham Civil Rights Institute where a series of galleries tells the stories of daily life for African-Americans, the Civil Rights Movement and the “walk to freedom”.